5 beautiful girls and 2 wonderful boys! We have 5 girls and 2 boys. All are quite healthy and alert. We have quite an assortment of colors and markings. They do have excellent lungs, when they can't find their seat at the milk bar they will squeal, very loudly! The Puppy Kiz mostly sleep and eat. They can do the 10 inch scoot to the milk bar really fast! They have wonderful lungs, they will squeal until they find the milk bar when they are hungry. They are consistently gaining weight. Bee is a wonderful Mom taking excellent care of her little ones. Puppy Kidz are nursing less this week than last. The feedings are lasting longer but less often. Their little legs are getting so strong. They will be walking in no time! They can now crawl instead of scoot. We have all eyes open. They don’t squeal as much but they do like to coo. They sound like pigeons. We are expecting the whelping box to get ‘lively’ in the next week with open eyes! This week we have seen a big change in the Puppy Kidz. They are all walking, finding their bark and, we have seen play activity. They are pawing at each other, biting ears, tails, and backs. They are bonding with each other. They are so big that Bee likes to just stand when they are at the milk bar. Bee likes to sit outside the whelping box and watch them because if she goes in the whelping box she will be attacked by the Puppy Kidz wanting a milk treat! Puppy Kidz started on lapping goats milk and we added porridge to the milk to start them on solid food. We have added toys for stimulation and have seen some play activity with the toys. Puppy Kidz are literally crawling out of the whelping box! Bee Sting 5 escaped twice! They are eating kibble in their porridge and drinking water. The play activity has been rough! They pull tails, ears, and bite each other. Their teeth are erupting and they are so cute to watch and cuddle. We have found the food bowl! Puppy Kidz found the food bowl and chowed down. They are weaned now and eat regular kibble. They love to play together and are so loveable. They have grown so much in 7 weeks. They want to be loved and held and will tell us about it if they don't get individual attention. We don't mind! This is the most fun stage in their little lives. The Puppy Kidz have found the toy box. They have toys all over the house! They beginning to do their 'business' outside and have grown so much this week. They are fully weaned and eating kibble. They are ready for their new homes. Taylor is named KandL's yoR Taylor Bee My Girl Forever. She is living in Wisconsin with her new Mom and Dad. Congratulations Adam and Kris on your new arrival! Libby is named KandL's yoR Little Libby Bee. She is living in Wisconsin with her new family. 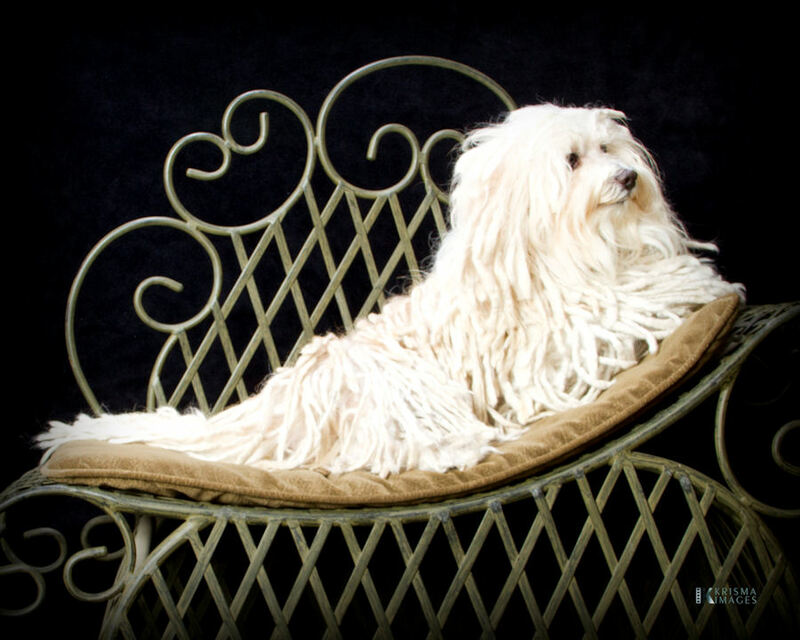 Libby will enjoy playing with her human sister and brother as well as her Havanese big brother Tucker. Congratulations to the G. family! We know you will spoil your new family member. Charles, KandL's yoR a Block Head Charlie Bee, is part of the KandL Kidz family. He wants to stay with us and has made himself at home in our home. Watch for Charles in the show ring. He's a sure winner!! Rosie is named KandL's yoR Rosie Bee Good. She is living in Iowa with her new family which includes Bella, Bee Sting 3 from the Bee Hive 1, for a big sister. Best wishes! These girls will bring you many years of happiness. Patches, KandL's Bee Patches with yoR Coat of Many Colors, is living with her new Mom and Dad in Indiana. Enjoy your play dates with Lola Patches. We will always love you and miss you! Your Mom will spoil you as you deserve and your Dad will teach you to play catch and retrieve with your balls. Take good care of our precious Little Patches and congratulations on your new little girl Gary and Gwen. Boo is named KandL's yoR BooBoo Bee My Honey Bear. She is living in Iowa with her new family. 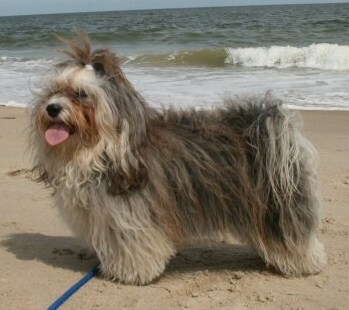 She has a big Havanese sister, Yogi. Congratulations Yogi and Stacey on your new little girl! I know she will be Yogi's conscience. Nino is named KandL's yoR Lucky Seven Bee My Nino. He is living in Iowa with his new family. 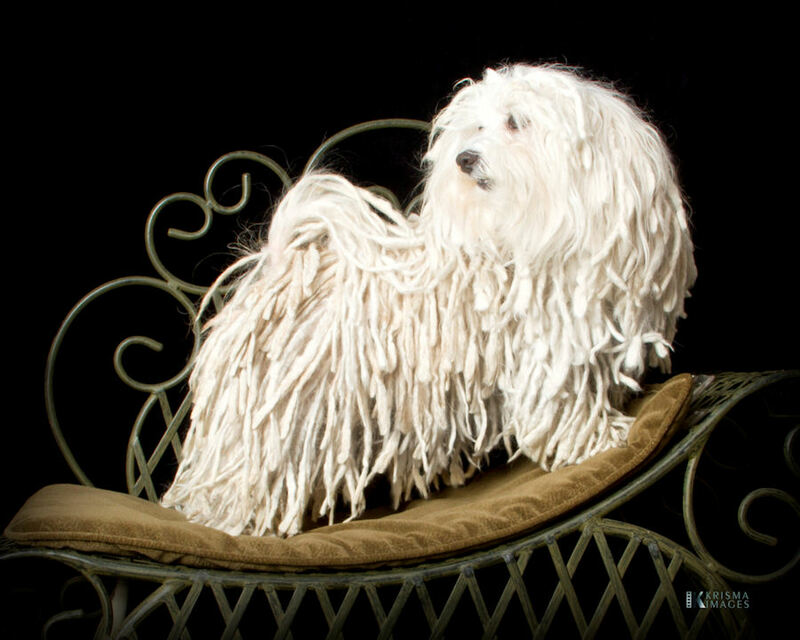 He has a big Havanese sister to play with named Lucy. Best Wishes to Lucy, Sue and, Hotch. Your new little boy will bring you many years of happiness and hours of playtime with Lucy. I have completed my second week of pregnancy now and I doing great! I have gained at least a pound already. I have to go outside more frequent to do my business, those Puppy Kidz are pushing on my bladder! I do need a lot of rest but I think it’s because of the morning sickness. I don’t feel so good in the morning. This weekend, Mom put me on her bed in the camper and made the rest of the Havanese herd STAY OFF. I had the whole bed to myself while Mom got dressed. It was so nice; I just curled up on her pillow and took a really good morning nap. When I woke up, I was ready to eat. I have completed three full weeks of pregnancy and starting my fourth week now. 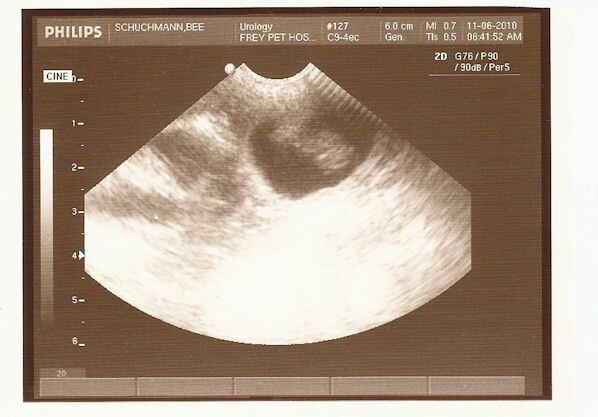 The Puppy Kidz are just embryos and have implanted into my uterus now. I really feel pregnant now. I’m really grumpy at times and growl at yoR allot. I have been starving! Mom allows me to eat as much as I want. She even gave me some pork roast this weekend. I was so hungry that I bit her finger when she was feeding me! Sorry Mom, I was just so excited and hungry. The morning sickness is still with me. I get up in the morning so hungry but I just look at my kibble, oh my, I want to eat but just can’t right now! I have to go back to bed for awhile until the nausea passes. Then I can eat. I feel really fat too. I must have gained at least another pound. It’s week four now! The Puppy Kidz will be developing their eyes and spinal cords this week and their faces will be taking shape. How exciting! I still can’t eat much without feeling nauseas so Mom makes me a very special meal. It has kibble, cottage cheese, and turkey in it. I really like it. She told me that tonight I can have a boiled egg. I get so tired and have to rest a lot but that’s ok, my Puppy Kidz need me to rest so that they can grow into healthy babies. I have an appointment with my OB GYN this week for my ultrasound. I can’t wait to see the first pictures of my Puppy Kidz. I had my doctor’s visit Saturday with my OB GYN. yoR went with me for support. 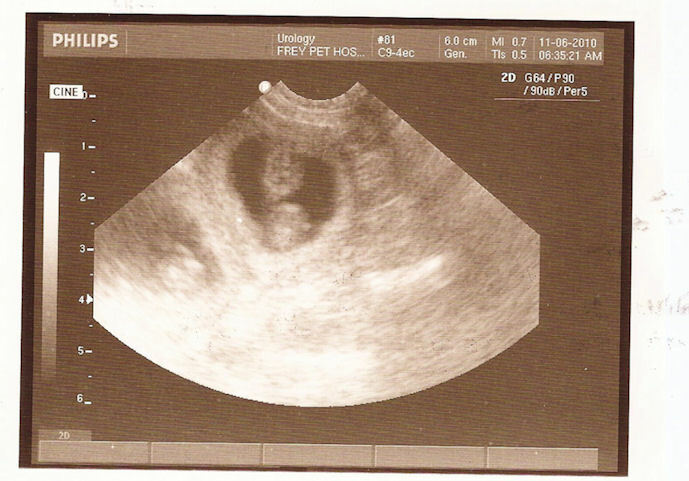 I got to have an ultrasound and see pictures of my Puppy Kidz. We saw arm buds, eyes, and noses. We even saw the heart beats! It was so cool. My doctor said that I have 5 Puppy Kidz to be conservative and possibly 6 Puppy Kidz. This is what she said the last time and I had 8! I’m planning on 6 this time which will be a much better number. 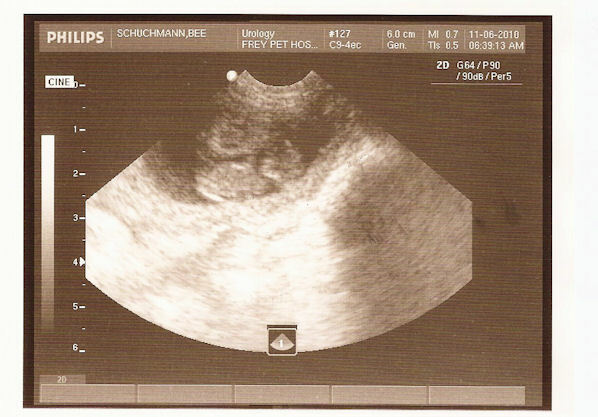 Mom said she wished that the ultra sound could be in 3D and color so that we could see the colors of the Puppy Kidz. I haven’t gained much weight yet but I’m guessing with my appetite that I will balloon this week. I just get to lay on my pillow and be the Queen that I am! OK, I’m just huge now! I can’t believe how big I’ve gotten. It feels like I have 10 Puppy Kidz, oh my! I can’t jump on the furniture now; I have to have help getting up and down. It’s terrible. I just want to rest all day and night. I do get some really good meals though. I got homemade roast beef last night mixed with my kibble. YUM! Now that I have completed my 6th week of pregnancy we can hear heart beats. Mom used my new ultrasound stethoscope last night and we heard all kinds of sounds including heart beats! Wow, it was really cool to hear the tiny hearts beating. Mom and I got the whelping box out and got it nice and clean for the Puppy Kidz. We even got all the items needed for my delivery. We are ready!! I just keep getting bigger! My belly is almost dragging the ground! I like to hide behind the couch or lay behind the driver’s seat in the RV but guess what? Those places are too tight for a pop belly pig like me! I think I’m going to have 10 Puppy Kidz! You know ladies how it gets to where you can’t see your toenails? Well for a K9 it’s I can’t lick! I take 2 steps, sit down, lick, CAN’T, 2 steps, sit down, lick, CAN’T, etc., etc., It is RUFF!! I just had my last appointment with my OB GYN last night and had my X-ray. We counted seven (7) little skulls and spines. Yes I have seven Puppy Kidz! Everything looked great except all my internal organs are pushed into my chest! It is difficult to breath with all those Puppy Kidz pushing on everything. It won’t be long now though, I have less than a week left. Mom has started taking my temperature twice a day now. When it drops I will deliver within 24 hours. I can’t wait! Mom asked me to deliver Friday night, I said I would try but you never know when Mother Nature will want these Kidz delivered. I gave Mom her wish! I delivered on Friday just like she asked me to. yoR and I have 7 beautiful Puppy Kidz. We have 5 girls and 2 boys. Delivery wasn’t too bad except Bee Sting 3. He was the worst! Ouch!! We have many different colors and markings and it’s just a beautiful litter of Puppy Kidz. Mom said that I was a champ. I’m a little busy now with tending to the milk bar so I must get back to my Kidz for now. Bee is very busy taking care of the Puppy Kidz so I’m going to take over writing the journal for awhile. Oh ya, I’m the Puppy Kidz Dad so I get to help out. I like to help clean the little guys. I need Mom and Dad to help hold them for me so that Bee doesn’t get me! She is still a little protective of the Puppy Kidz. Hapi and Missi are terrified of her. They are really scared of Bee and won’t go near the whelping box. Bee has the fear of God in them! I’m not that scared of her but I do want some protection from Mom and Dad! Hi all! Bee is still busy with the Puppy Kidz this week. She doesn’t spend as much time in the whelping box as she did last week but she still spends a lot of time with the Kidz. She is such a wonderful Mom and she is getting her figure back, oh ya, she’s looking good! I get to lick the Puppy Kidz more this week and she is allowing Hapi and Missi to give them kisses. She’s mellowing out somewhat but, she limits the time we get to spend with them. I’m scared of her bark and don’t even want to see her bite! I’m back! The Puppy Kidz don’t need as much of my attention now that they are 4 weeks old. They like to play together and I get to spend more of my time out of the whelping box. I like to lie outside the whelping box and just watch them. I chewed on my chewie last night and watched them all night long. Of course I go in the whelping box to feed them and care for them. They are such a beautiful litter! Missi likes to look in at them and whine. She wants to play with them but I told her that she has to wait a few more weeks until they are older. She just loves her brothers and sisters. This morning Mom and I gave them porridge, no we didn’t take it from the three bears, he he. They just loved it and, yes it was the right temperature. We are teaching them to eat solid food on their own. They will be ready to leave the nest in no time. The Puppy Kidz have really developed their personalities this week. They play for awhile, and then sleep for awhile. I even get close to the whelping box they cry for the milk bar! They are getting really strong now; Bee Sting 5 crawled out of the whelping box twice! It was in the middle of the night and I had to wake Mom up to put her back in. I plan to start weaning them next week. Mom has started putting ground kibble in their porridge. They seem to really like it and have done quite well with it. I have started limiting the milk bar sessions to teach them to eat solid food. I just love to sit close and watch them play. They pull ears, tails, and bite each other. We even have wrestling matches. It’s so much fun! My little Puppy Kidz are so grown up now. They are weaned now and eating kibble. I only nurse them when I need to relive some pressure if you know what I mean! I don’t clean up after them either, yea, Mom does that now. I just get to love them now and play with them. I like to sit and watch the sleep. They are so sweet when they are sleeping. I also love to give them kisses. They love my attention! Missi likes to play with them but yoR and Hapi don’t like to play with them. I think they are scared of the Puppy Kidz. He he! My little Bee Stings are all grown up now and ready to leave the Bee Hive. It’s sad but I know they have the most wonderful homes to go to. They will be happy and healthy and, loved dearly just as I have loved them. I will send them away with all my love.